Liverpool piled more misery on Arsenal. Goals from Sadio Mane, Roberto Firmino, Danny Sturridge and Mohamed Salah ensured the Reds marched past Arsenal in an emphatic manner. The Anfield side are still unbeaten this season whereas Arsenal succumbed to their second successive defeat of the season albeit in a humiliating fashion, a result that has seen them drop to 16th in league table, nevertheless. It was an entertaining game at Anfield, and this is what we learnt. Liverpool has been enmeshed in a transfer saga with their midfielder Coutinho wanting to leave for a dream move to Barcelona, despite several bids Liverpool is still standing firm and hoping to keep their most prized asset stays put at Anfield, but off from Coutinho's transfer wrangling Liverpool hasn't shown any sign of the Brazilian being missed on the pitch. Jurgen Klopp has effectively got his men playing some good football without Coutinho. No player is bigger than the club, they say Liverpool should consider allowing Coutinho his dream money while they reinvest his transfer money into better quality players. Liverpool's Attacking Trio will hurt teams. 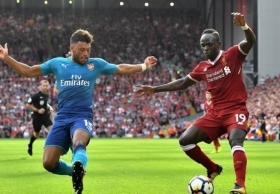 Sadio Mane, Firminho and Mohammed Salah were terrific again and proved too strong for Arsenal's defense who found them difficult to cope with. They have now scored nine goals within themselves this season and no doubt there will be more to come from them as the season goes, opposition defense will have a lot of work to do if they are to stop the Liverpool's inform forwards from breaching their defense. The manner of which of Arsenal succumbed at Anfield ridiculous just to put it lightly, lacking any sort of fight and cohesion. Arsenal hardly troubled Liverpool whole game and barely managed any shot on target. The worst culprit of Arsenal's humiliating defeat was Danny Welbeck, a surprise starter ahead of Alexandre Lacazette and Oliver Giroud. The Englishman missed a glorious chance to nick the first goal for Arsenal and offered nothing in attack, make it eight goals conceded in three games so far Arsenal fans might be in for a long grueling season as their defense doesn't seem to stop conceding goals, the worse may yet to come unless Arsene Wenger finds quick fixes to the team's issues. Arsene Wenger needs switch formation as he tries to revive his beleaguered team's fortunes, the 3-4-3 formation currently used by Arsenal, seem not to be working anymore, after scraping an opening-day victory over Leicester Arsenal has been below par in recent games, players themselves no longer look confident in the setup as its evident with their performance, with football going on international break, Arsene Wenger has all the time to decide and switch back to 4-2-3-1. Jurgen Klopp Needs FSG's Support. Jurgen Klopp has been calm on Liverpool's transfer dealings this summer, the situation, nevertheless, isn't encouraging, with four competitions to play for this season Liverpool are in need for signings if they are to back the glory at Anfield, Jurgen Klopp is no doubt a good manager, but he will need a good level of support, especially on transfers if he is to achieve any success with Liverpool, with Coutinho expected to leave for a big-money move to Barcelona, FSG will do well and give Jurgen Klopp to buy quality he needs.